When Morah and I were house shopping, we agreed that our #1 priority for new furniture was a new bed. For the past 5 years, we’ve been sleeping on a full size bed. (Bear in mind that we both like to sleep all spread out.) Because of other major purchases we needed (a refrigerator, and washer and drier), we had to put off buying a new bed until now. A couple of weeks ago, we went out mattress shopping. Morah and I both did a bunch of research, and I was keen on trying out a latex mattress. Morah had money in mind, and wanted a balance between comfortable and affordable. Although I agreed, I felt that it was acceptable to spend a little more. After all, we’ll be spending a third of every day of our lives in bed, and the mattress we choose now will (ideally) last us for a long time; possibly even the rest of our lives. In our research, we found that there’s no way to compare mattresses from one store to another – or even within the same brand! 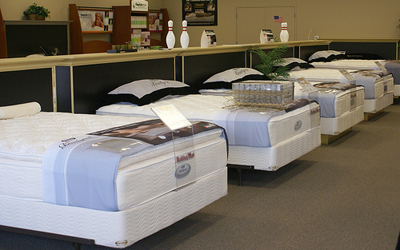 Basically, you just have to go from store to store and try out different mattresses until you find one you like. A daunting task, to say the least. We headed out, prepared for a full day of trying out mattresses. Consumer Reports suggests that you spend about 15 minutes on each mattress to really get a feel for it, so we knew it was going to be a long day. When we walked into the first store, we weren’t really sure what to expect, but the salesman was pretty helpful and quickly narrowed down the choices for us. From there, it was just a matter of laying on the mattresses and trying them out. We found a pocked coil spring mattress that we liked, and it was on sale for a very reasonable price. We thought we had found the mattress we were going to buy, but to be sure, we wanted to shop around a bit. Not knowing anything about mattress shopping worked so well for us at the first store that we decided to pretend we knew nothing at the second store. It also worked out pretty well, although now that we did actually know a thing or two, we were able to steer things in our favor a little more. The nice thing about shopping when we did was that the stores were pretty much empty. As a result, we got very attentive service and we able to try different mattresses in the store at our leisure and without interruption. If you go mattress shopping, I high suggest doing it in the middle of the day on a work day. We tried several different mattresses at the second store before finally making it to the latex mattresses, which we didn’t get to try at the first store (the salesman there didn’t bother showing us those, and I’m not even sure they had any). Whoever decided to make a mattress out of latex is a freakin’ genius. It’s so soft and comfortable, yet supporting at the same time. As soon as we lay down on the bed, we were hooked. After discussing which mattresses we liked the best, there was no contest. The salesman knew our budget, so he called the store owner and got us a fantastic deal. After a seemingly interminable wait, our mattress arrived on Saturday. The thing is huge. Not only is it quite a bit longer and wider than our old bed (twice as wide almost 2 feet wider, in fact), but it’s taller as well. We made sure to order a half-height box spring to make up for the height difference. Despite that, it’s noticeably taller than our old bed. Sunday morning was… Amazing. When I woke up, I felt so well rested. My back didn’t hurt at all and I didn’t have any muscle fatigue. I didn’t want to get out of bed, so I didn’t! Morah and I had watched a movie in bed the night before, so I decided to watch another movie to prolong my time in bed. It was slightly more expensive than we had budgeted, but if I get to sleep like this for the rest of my life, it was worth every penny. When Kris and I bought our first mattress together we too didn’t really know what to expect or how to best go about it. Luckily, when we walked into the Northwest Bedding store, we were approached by a salesman that was like us. Tall and pleasantly plump. He suggested a bed with extra support along the edge for us “bigger people”. We tried it out and were hooked. Let me say, almost seven years later, it is still the best investment we’ve ever made. We love our bed! One word of advice to keep your bed strong for years to come. Do rotate it once every two weeks for the first six months and once a month for the remainder of the 1st year. Then you can rotate it once a quarter after that. I know it sounds like a lot but it is so worth it. An easy way to keep track is to label your mattress. Get a sharpie and put a 1 in the top right corner of the mattress. Now, rotate the mattress without flipping it over. Now put a 2 in the top right corner. Then, flip the mattress over. Put a 3 in the top right corner on the same side that now has an upside down 2. Flip the mattress around again (without flipping over) and put a 4 in the top right corner on the same side with an upside down 1. This way you will always know which way to flip your mattress! A lot of mattresses now are “single sided,” so you don’t flip them over. Obviously, that makes it important to know which you have. Rotating them is probably still a good idea, though. Don’t forget about our awesome bamboo sheets! Best. Sheets. Evar.